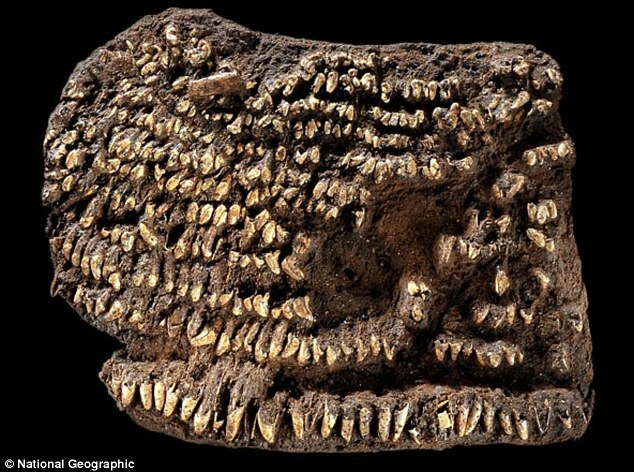 Excavators have unearthed what they believe to be the world’s oldest handbag, a Stone Age purse dated between 2,500 and 2,200 BC which is decorated in over 100 canine teeth. The incredible discovery – the first of its kind – was made in a grave which forms part of an ancient burial ground on a 250-acre excavation site near Leipzig, Germany. More than 100 tightly packed dog teeth were found inside the grave on the site at Profen, andSusanne Friederich, the archaeologist who managed the dig, believes they originally formed the decorative outer flap of a Stone Age handbag. 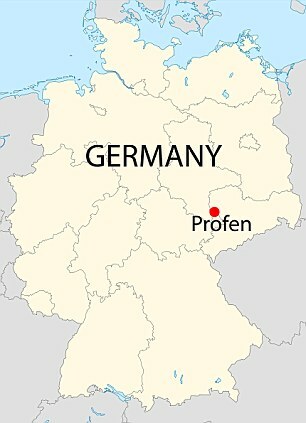 Ms Friedrich, of the Sachsen-Anhalt State Archaeology and Preservation Office, said: ‘Over the years the leather or fabric disappeared, and all that’s left is the teeth. ‘They’re all pointing in the same direction, so it looks a lot like a modern handbag flap. The revelatory dig is just one phase of an enormous excavation project being undertaken before the Profen site is turned into an open-pit coal mine, due to take place in 2015. So far the team has uncovered evidence of Stone and Bronze Age settlements, including more than 300 graves, hundreds of stone tools, spear points, ceramic vessels, bone buttons and an amber necklace. There have also been thousands of finds from later periods, including the 50BC grave of a woman who was buried with half a kilogram of gold jewellery. 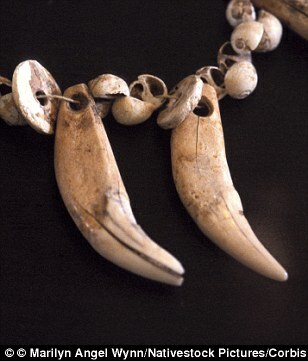 While the dog-tooth handbag is extremely rare, canine teeth are actually a fairly common find in Stone Age burial sites in northern and central Europe, Friederich told the National Geographic. In fact, so many teeth have been excavated from graves around the region that it suggests dogs were as much livestock to Stone Age man as they were pets – the handbag’s decorative panel alone required the teeth of dozens of animals. 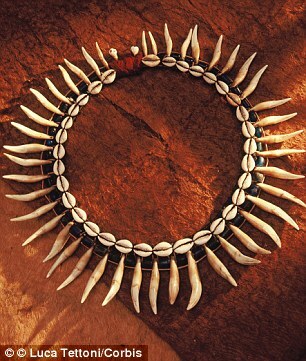 Most commonly, dog teeth were used as hair ormaments and in necklaces for both men and women. In other Stone Age burial sites, dog and wolf teeth – as well as shells – have been uncovered in patterns suggesting corpses were covered with studded blankets, the material of which has long since disintegrated. ‘It seems to have been very fashionable at the time,’ said Harald Staueble, senior archaeologist at Germany’s Saxon State Archaeology Office.